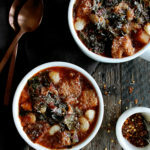 Even though winter is winding down, I am absolutely not ready to give up big cozy bowls of soup yet, especially this Tuscan Ribollita Soup with Swiss Chard & Butter Beans. 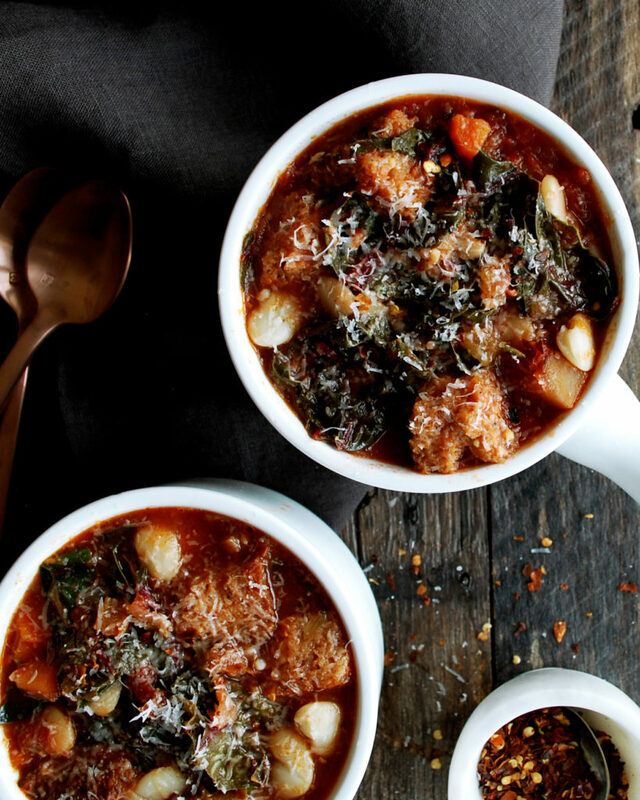 This ribollita soup has got to be one of my favorite soups to date. Alright, maybe it’s a tie between this and my French onion soup. 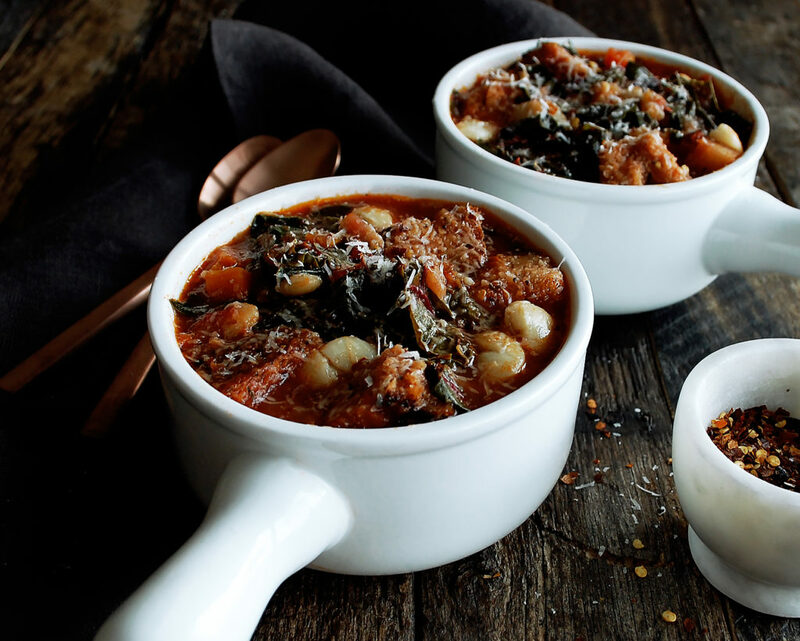 But, nevertheless, it’s everything you want in one bowl…rich tomato broth, lots of vegetables and greens, butter beans for protein, and salty, irresistible cheese. And did I mention this soup has toasted bread in it? Yes, toasted bread gets stirred right into the soup at the very end of cooking, which makes it ALL the better. I like using a grainy bread to add good texture and hearty flavor. The rest of the ingredients are pretty classic and comforting. They all come together in a tomato-based broth that’s thickened slightly by the vegetables and beans. It’s basically the perfect cozy, healthy meal. 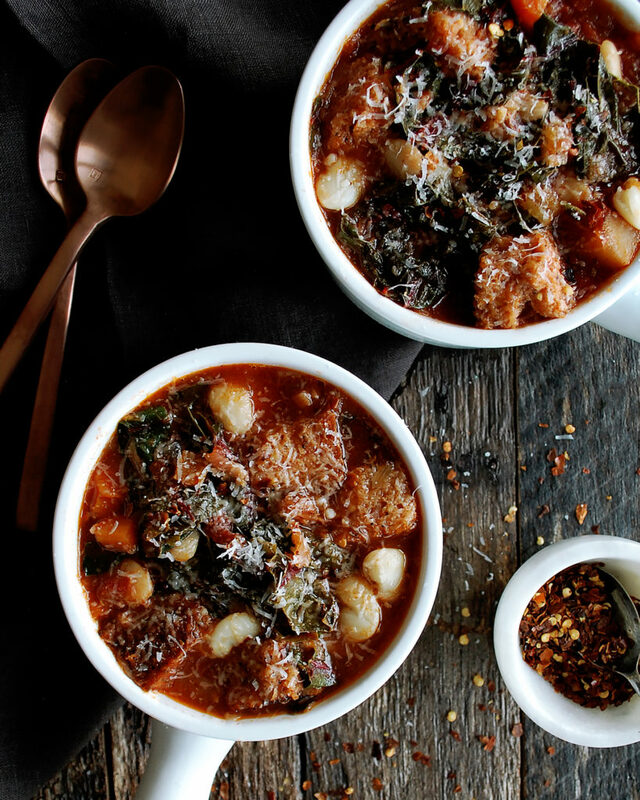 I’m definitely embracing this Ribollita soup as much as I can while the chilly weather lasts (which basically means I’ll be making it once a week, at least). It is SO good. And I love having it on hand to heat up for a quick lunch, too. Heat a large, heavy-bottom pot or Dutch oven over medium heat. Add enough olive oil to coat the bottom of the pan. When the oil is hot, add the onion, carrots, celery, and parsnips. Let sauté for about 6 minutes until tender and slightly caramelized. Season with salt and freshly cracked black pepper. Stir in the garlic and let cook for another minute or so. Stir in the tomato paste and mix until incorporated. Let cook and caramelized for about 3 minutes. Deglaze the pan with the red wine, scraping the bottom of the pan to release all the flavorful bits. Bring the wine to a simmer. Add in the whole, peeled tomatoes, crushing the tomatoes as you add them. Stir in the parmesan rind, red pepper flakes, and water. Bring the mixture to a boil, and then reduce the heat to low. Simmer the soup for about 40 minutes, stirring occasionally. Stir in the Swiss chard and butter beans. Cook for another 5 minutes. Meanwhile, heat a large sauté pan over medium-high heat. Coat the bottom of the pan with olive oil. Add the cubed bread and toast until golden and crispy. Season with a pinch of salt. 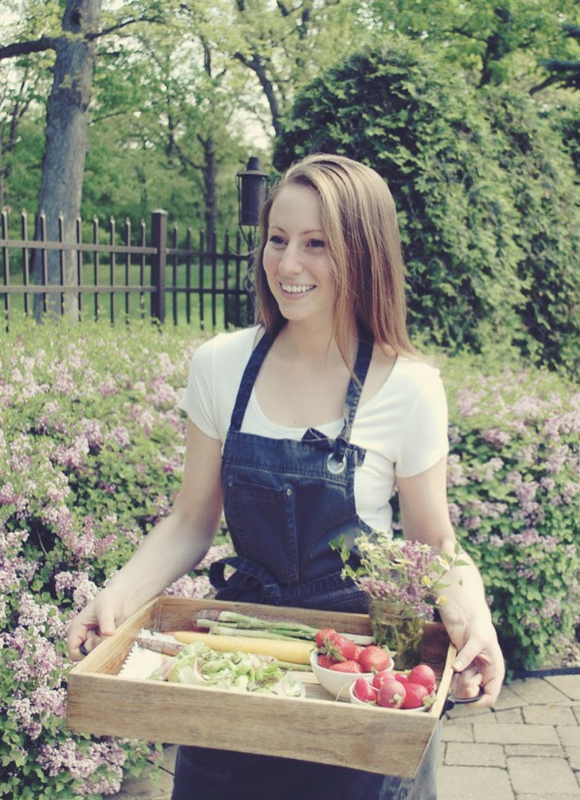 When you’re ready to serve, stir in the bread into the soup at the very end. Taste the soup and season with salt as needed. Serve the soup with a drizzle of olive oil, a sprinkle of red pepper flakes, and a good amount of freshly grated parmesan cheese. Thank you SO much, Megan. I appreciate it!